Making of a Cook, Madeleine Kamman, 1971: Hard cover book with dust jacket published in 1971 by Atheneum. 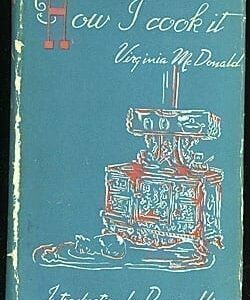 Presumed first edition, first printing. 560 pages. The dust jacket is battered. The book is in mint condition. Definitely gift quality. Written by Madeleine Kamman, a chef born in Paris and educated at the Sorbonne, the Cordon Bleu Academy and the Ecole des Trois Gourmandes of Julia Child. Kamman moved to the United States, because a U.S. citizen, and operated her own cooking school in Boston, Modern Gourmet, Inc. The Making of a Cook is notable because it tells you WHY things happen as they do, explaining the actual physical happening inside a successful sauce, crepe, soufflé, quenelle or terrine. In other words, Kamman is not just cook, she’s a physicist. I have never in my life managed to make a decent hollandaise sauce. But I’m going to try again, using Kamman’s method. See her recipe in our Antique Recipes department.